Austrian merchant; born at Tuschkau near Pilsen, Bohemia, Aug. 28, 1766; died at Vienna April 18, 1845. Early bereft of his father, he quickly developed an inclination for mercantile pursuits, so that, when only twenty-one years of age, he established a wholesale house in Prague which soon ranked among the most important in the country. He encouraged improvements in the raising of sheep, and also introduced new methods in the carding and manufacturing of wool. Prompted by feelings of patriotism, he rendered his country valuable services, especially during the Napoleonic war. Thus, in 1801 he purchased all the magazines containing salt, flour, and wheat which had been captured by the French, and in 1805 he bought all the artillery pieces taken by the enemy, thereby saving Austria more than 3,000,000 gulden. In 1809 he negotiated the purchase of 450 tons of biscuit for military provisions, declining to accept any profits or commission. Lämel gave further evidence of his devotion to his emperor and his country by lending the government large sums of money. In order to facilitate the withdrawal of the French troops from Vienna he in 1809 lent to the state his entire fortune. In view of his recognized services he requested permission to purchase a house in Vienna, but on March 17, 1811, the emperor declined to grant this petition. 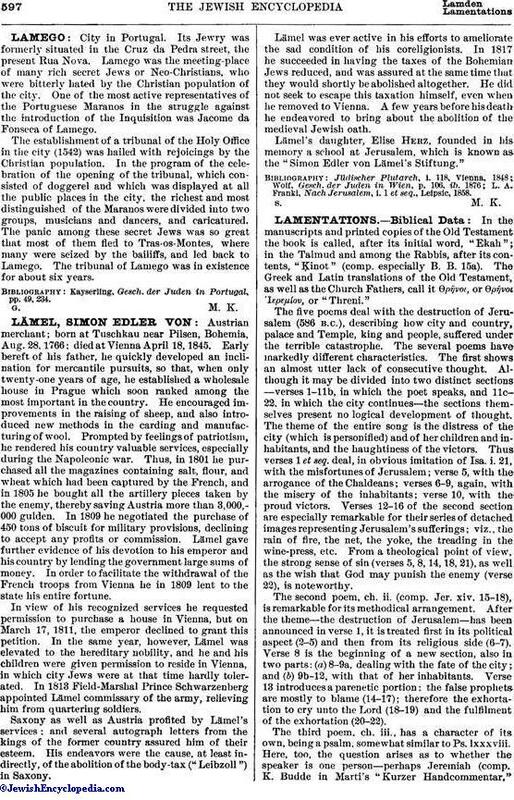 In the same year, however, Lämel was elevated to the hereditary nobility, and he and his children were given permission to reside in Vienna, in which city Jews were at that time hardly tolerated. In 1813 Field-Marshal Prince Schwarzenberg appointed Lämel commissary of the army, relieving him from quartering soldiers. Saxony as well as Austria profited by Lämel's services; and several autograph letters from the kings of the former country assured him of their esteem. His endeavors were the cause, at least indirectly, of the abolition of the body-tax ("Leibzoll") in Saxony. Lämel was ever active in his efforts to ameliorate the sad condition of his coreligionists. In 1817 he succeeded in having the taxes of the Bohemian Jews reduced, and was assured at the same time that they would shortly be abolished altogether. He did not seek to escape this taxation himself, even when he removed to Vienna. A few years before his death he endeavored to bring about the abolition of the medieval Jewish oath. Lämel's daughter, Elise Herz, founded in his memory a school at Jerusalem, which is known as the "Simon Edler von Lämel's Stiftung." L. A. Frankl, Nach Jerusalem, i. 1 et seq., Leipsic, 1858.